Click here to view the latest edition of Cummins Commentary! In the latest issue of Cummins Commentary we visit several well-known trucking fleets, Riordan Grains and O’Sullivan’s Transport, to gauge their opinion on the Cummins ISXe5. We also reveals details of the new high-output, lightweight 12-litre truck engine that Cummins has begun field testing in Australia at 500 hp. One of the biggest mining excavators in the world, the 4000 hp Liebherr R 9800, is the focus of another article as it digs big tonnages in the Hunter Valley, powered by dual Cummins QSK60 MCRS engines. 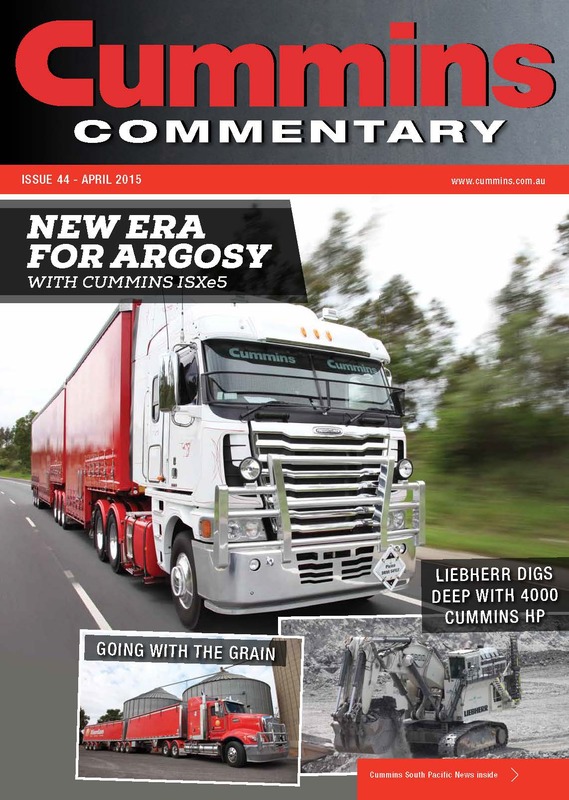 Click here to view issue 44 of Cummins Commentary. Termites, copper dust, fierce heat, remoteness… these were just some of the challenges facing Cummins when it set out to design and build a new power station for a copper mine in north-west Queensland. The power station for Cudeco’s Rocklands copper mining project is one of the largest power generation projects undertaken by Cummins in Australia. 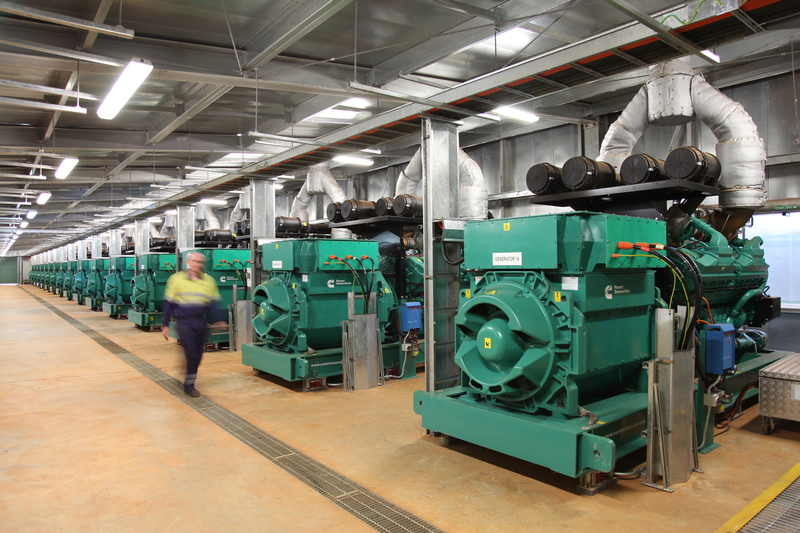 Sixteen Cummins generator sets, delivering a total of 18 MW, will be vital to the operation of the Rocklands processing plant which will produce copper, cobalt, gold and magnetite at a rate of 3.0 million tonnes per year. The Rocklands project is 15 km west of outback Cloncurry, a town that claims to have the highest official temperature recorded in Australia at 53.1 °C. Obviously the region is parched by intense heat, a major factor influencing the design of the power station. Cummins was selected to design and build the power station by Chinese giant Sinosteel Equipment and Engineering Co. Sinosteel is currently building the Rocklands processing plant which it owns and expects to complete by mid-2015. “Cummins is a well proven brand in China, one of the key reasons we were selected by Sinosteel for the Rocklands project,” says Shane Rigney, who has headed up the all-encompassing project for Cummins. “Our ability to design, supply, install and commission a complete turnkey power station was another key factor behind Cummins being awarded the contract. Sinosteel’s commercial manager for the Rocklands project, Yu Peng, says the turnkey power station “reflects Cummins’ reputation globally…we’ve had no concerns from day one”. He describes the power station as “very impressive” and an example of what can be achieved when two companies like Cummins and Sinosteel forge a partnership. The Rocklands power station is a showcase facility, certainly a credit to the Cummins team – steered by project leader Shane Rigney and general manager of power generation projects Birol Guler – who ensured it was completed on time. Cummins’ scope for the project extended well beyond the supply and installation of the 16 generator sets powered by one of Cummins’ biggest diesel engines, the 60-litre QSK60. “Our work included all civil, electrical and mechanical engineering; design and construction of the steel-framed acoustic building housing the generators; design and construction of the high voltage switch room and supply of all low voltage switchgear; supply and installation of the Cummins digital master control system; and supply and installation of an auxiliary transformer in a kiosk,” says Shane Rigney. He points to other features such as the dust filtration system which incorporates 48 filters and two massive fans per engine with the ability to deliver 26 cubic metres per second. The fans draw air through the filters, pressurising the room and supplying cooling air for the generator sets. Cooling is also provided by remote-mounted radiators supplied by Air Radiators which allow the C2250 D5 generator sets to operate continuously in ambient temperatures of 50°C. The vertical exhaust stacks are 20 metres high, an EPA requirement. The C2250 D5 generator set has a prime power rating of 1600 kW but in the case of the Rocklands project the units are rerated to 1349 kW to allow for continuous operation in high ambient temperatures. The fully integrated system incorporates Cummins PowerCommand digital paralleling equipment and a Cummins DMC200 digital master control system. All underground cabling for the power station – 20 km of it – is chemically treated for termite resistance. The noise level requirement for the acoustic building housing the generators is 80 dBA at 1.0 metre. Engine oil and coolant changes are a simple procedure via a remote control system. A 10,000-litre fresh oil tank is installed on site along with a 5,000-litre waste oil tank and two 20,000-litre diesel day tanks. OH&S was a key consideration in the design. In fact, the heaviest item a Cummins technician will have to lift during routine maintenance is an oil or air filter. In the latest issue of Cummins Commentary we visit Cloudbreak iron ore mine in WA’s Pilbara to see how a fleet of Cummins-powered excavators are performing in moving 470,000 tonnes of overburden and ore a day. 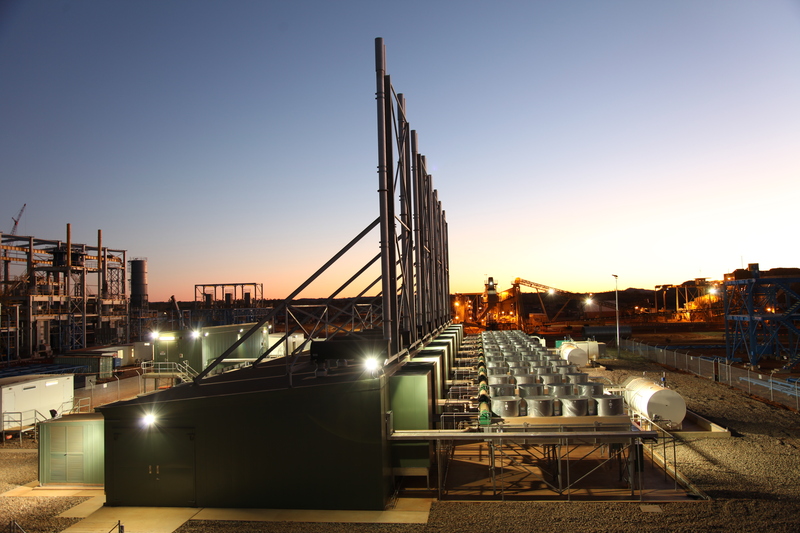 There are many more articles, including a report on Cummins’ biggest ever generator set, the QSK95, four of which will provide emergency power at the new Sunshine Coast public hospital in Queensland. We also focus on how women are thriving in Cummins’ workshop environment in Australia.